If you’re relatively new to Needle ‘n Thread, you might not know that my first forays into advanced embroidery techniques came about due to an interest in historical ecclesiastical embroidery. I was taking a history of art class in my early days in college, and one of the works of art I chose to research was a piece of ecclesiastical embroidery. I chose it not so much because it was embroidery – rather, I chose it because it was beautiful and because it was different from the more common artistic mediums my classmates were focusing on. Over time, with a bit of study, a lot of experimentation, and making contacts in all kinds of interesting corners of the globe, I amassed an interesting collection of pieces, books, pattern portfolios and the like, along with many tidbits of information on the hows, whats, and whys of ecclesiastical embroidery. From all that sprang a love and appreciation for hand embroidery, which I had dabbled in as a kid and through college, but never really saw as art until captivated by that first research project. In ecclesiastical needlework, all the elements of the art of embroidery – and any art, really – come together. Purpose, technique, materials, thought, skill, symbolism, color, balance, beauty, proportion, order – you can find all these things in ecclesiastical needlework, whether you’re religiously minded or not. It is a fascinating medium to study, especially when it comes to the development and dissemination of historical needlework techniques. Since it’s Good Friday, let’s take a close look at some pieces of Ecclesiastical (religious) figure embroidery that have crossed my path lately. The figures are somewhat similar in some ways, but vastly different in others. We’ll look at the differences and draw some conclusions. Both pieces of figure embroidery that I’ll be showing you are from vestments, which are the garb worn by priests during the liturgy, or public prayers of the Church. Now, you might wonder why these things are on vestments. In traditional liturgies, the priest used to face the altar, leading the congregation in prayer and focusing the congregation towards God and away from self. Because the ornamentation inside a church was meant to lift the mind to God, the most embellished part of the priests’ garb was the back, since that was the part seen by the congregation. Through ecclesiastical embroidery, just like through stained glass windows, stories could be told or a statement could be made that would help move the mind towards God in prayer. The figure on the left in the photo above is from a cope, which is a large cape worn during specific liturgical functions. The cope has, on the back of it, an ornamental “hood.” It’s not a real hood (usually) – it’s kind of like a scooped flap of fabric. It’s the perfect “canvas” for ornamenting this particular vestment. The hood is somewhat large, so there’s lots of area to embellish. The figure on the right is from the back of a chasuble, which is the outer garment the priest wears specifically during the Mass and not at any other time. You can see an example of chasubles – both modern and antique – here on Wikipedia, if you’re curious what a chasuble looks like. Anyway, we’ll call the figure on the left the “Cope” Christ and the figure on the right the “Chasuble” Christ. 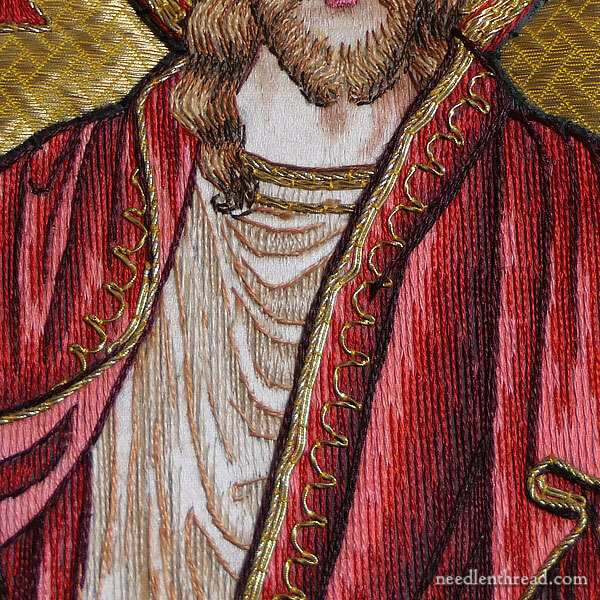 The Cope Christ is a fully embroidered piece of figure embroidery. The shading is pretty magnificent on the face and in the details of the clothing. 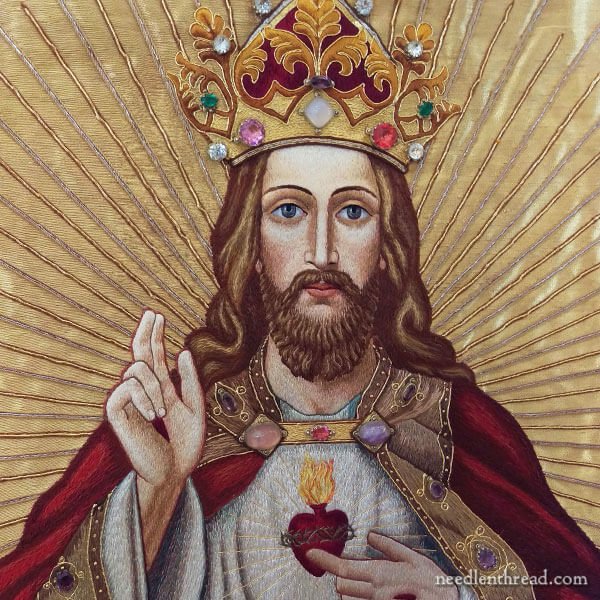 You’ll also notice the use of semi-precious stones on the crown and the cope that Christ is wearing. These all bespeak a special vestment, made with some purpose in mind, commissioned specifically for an occasion or celebration, and most likely commissioned through a small workshop or even an individual. The Chasuble Christ is a different kettle of fish. The figure is not totally embroidered. It is painted on fabric (silk), and over the painting (which creates the shaded detail) stitches are worked to give the impression of shaded embroidery. This latter approach to ecclesiastical figures – which developed in the 1800’s and was common through the first half of the 1900’s – was a less-expensive and quicker way to produce figure embroidery for vestments. Though there is certainly more “shine” in the Chasuble Christ (with the use of synthetic gold threads), the piece does not bespeak a specific commission. Instead, it has the flavor of a larger workshop piece, made for general use – kind of like making “off the rack” clothing, when compared to the cope example above. The face on the Cope Christ is slightly less than 4″ inches from the top of the head to the tip of the chin. When considering the Cope Christ, it is amazing that, although solidly embroidered in a relatively small space with exquisite detail in shading and expression, the stitching doesn’t look thick, gloppy, or heavy. It’s smooth and precise. You might notice that the eyes seem somewhat large in proportion to the face. Keeping in mind that these images were to be seen from a distance, the exaggerated size of the eyes helps to better convey expression. Notice the solidly embroidered hair, too. These aren’t separated lines of split stitching or chain stitching, but rather solid long-and-short stitch shading. This speaks to a definite high level of skill on the part of the embroiderer. On the Chasuble Christ, the face is approximately 2.5″ in length, from top of head to tip of chin, maybe slightly smaller. It is painted first and then stitched over in a very sketchy way, to bring out details. 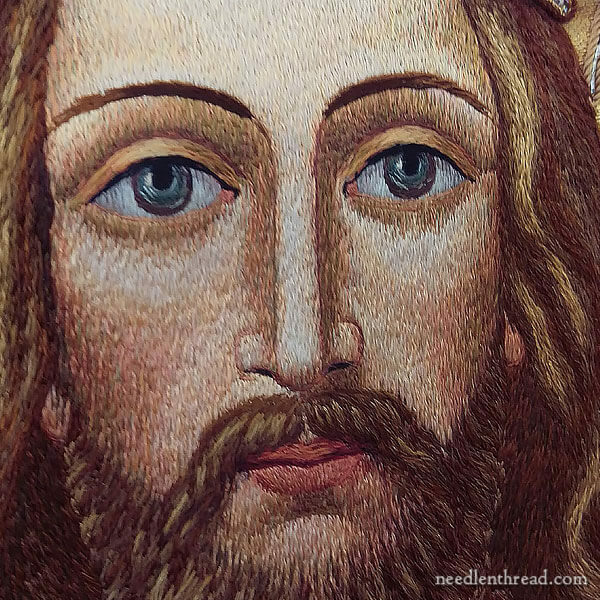 This type of stitching does not quite require the same level of skill found in the facial embroidery on the Cope Christ. 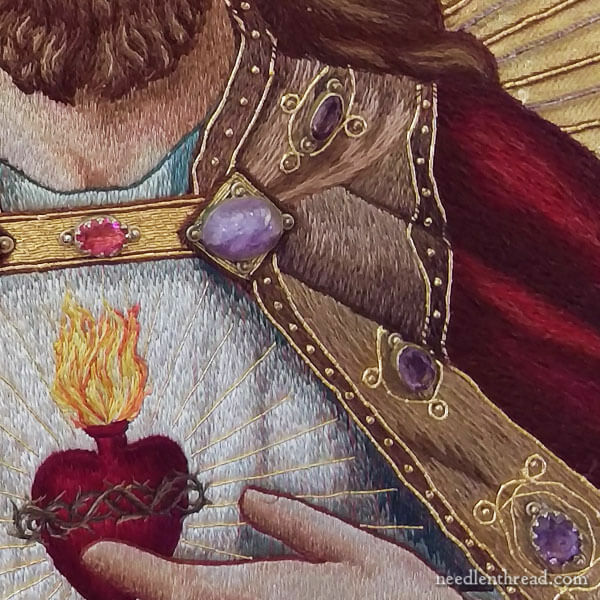 Looking at the clothes on the figure, you can see that the Cope Christ is detailed, solid shaded embroidery, trimmed out with gold threads and semi-precious stones. Relying completely on shades of thread and precise stitching, the embroiderer created realistic folds, shadows, and creases in Christ’s garb. The garb on the Chasuble Christ is layered appliqué of colored fabrics, over which dark outlines are embroidered to indicate folds in the fabric, and straight lines of long split stitching are added to created the shaded effect. Synthetic gold threads are worked in a light filigree around the edges of the garb. As you can imagine, this type of figure embroidery involving stitching over colored appliqués would progress much faster than the needlepainted garb on the Cope Christ. I don’t have access to the Cope Christ, but I do have access to the Chasuble Christ. Most of that vestment is sitting in my workroom right now. The Chasuble Christ is the central medallion on a chasuble that involves an unfortunate and odd mix of elements. I think the Chasuble Christ is probably older than the Cope Christ. The Chasuble Christ was probably made at the last part of the 1800’s to the first part of the 1900’s in a large workshop somewhere. The Cope Christ could have been made any time, even up to today. The materials and techniques are certainly still available. The style is not as common today, but traditional liturgical garb is still made and used. I can’t even guess on that one, since I haven’t been able to handle it and see it up close. The photos were taken in a sacristy while it was being prepared for use. What I do know is that each piece represents two extremes of the figure embroidery Scale of Skill. The Chasuble Christ is a relatively low-skill piece, probably worked in assembly-line fashion, by many different people familiar with the craft of wielding a needle, but not necessarily the art of embroidery. The Cope Christ is a high-skill piece, probably worked by one or two very skilled embroiderers who had a sense of art – you can see this in the expression on the face, which is much more “alive” than the expression on the Chasuble Christ – and who had a real sense of embroidery as an artistic medium. As far as expense goes, the Chasuble Christ would have been a relatively inexpensive embellishment. The Cope Christ, on the other hand, bespeaks a definite investment (no pun intended) in the garb for some special reason. But I’m personally keen on the Cope Christ. I prefer the expression in the eyes, the beautiful shading and details. I could take or leave the style of crown, but overall, it’s a really lovely piece! Fascinating, Mary. (Is embroidery forensics a term? ☺) Just the right post for today…blessed Resurrection Sunday to you and yours! Wonderful post! Thank you for the close ups and the detailed explanations of each. Fascinating!! 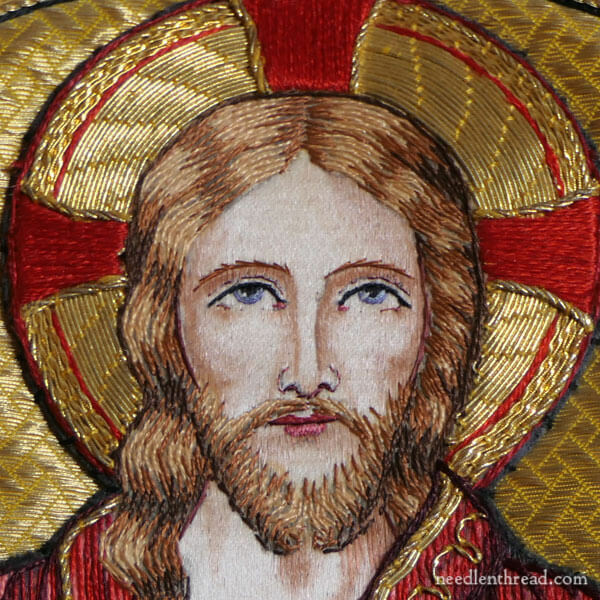 Thank you for the information on one of my favorite subjects – Ecclesiastical Embroidery. I agree that both hold a beauty but the Cope Christ is my favorite. Still being relatively sort of new to embroidery (at least actually doing it), I was pleased that my mind was recognizing the stitching technique in the Cope Christ, and working in my head how the colors came together. If you ever know of a book that teaches this type of religious work, please let me know. I am not adventurous enough to try on my own. How beautiful! And what a very nice comparison – thank you for this Good Friday-appropriate post! I am partial to the Cope Christ as well. It is staggering how smooth the tiny shading stitches on the face, hands, etc. are. It’s hard to guess how much time it would have taken to create this work of art. Thank you Mary for another fascinating article on ecclesiastical embroidery and your personal history. Thank you, Mary, for posting and explaining the embroidery on these two garments. In addition to the differences in stitching, the cope is an example of a regal, masculine and somewhat Byzantine Christ while the chasuble seems more a “holy card” saccharine and feminized style. St. Margaret Mary Alacoque’s visions led to the celebration of the feast of the Sacred Heart’s establishment in France The 1856 adding the same observance to the calendar of the Roman church by Pius IX and the dedication of the world to the Sacred Heart by Leo XIII 1899 were also based on the visions of women. The cope seems something a ranking cleric would wear at one of these celebrations. Yes, the Byzantine look is definitely there, though softened a bit from the icon imagery. Lovely post. Perfect for Good Friday. oh the opulence of christendom. Beautiful and fascinating! Incredible work! I did not know that about the eyes; I’ll have to start looking at the eyes more. Thanks for sharing on this Good Friday. Thank you for this wonderful post, Mary. Mary: Thank-you for a beautiful explanation of the Vestments Priest wear, I grew up with the Priest facing the Alter/Tabernacle, I do wish we could go back to them times. You have done some great research, I thank-you for that. I do like the Crown myself, Jesus Christ is the only one with such a beautiful Crown. Mary, thanks for sharing this on Good Friday. 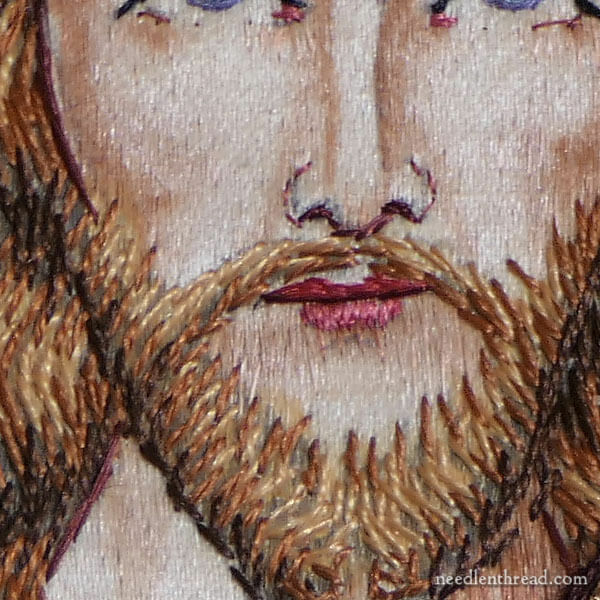 I am in awe with the stitching in the Cope Christ. I wonder what the congregation thought when the priest first wore this at a church service! And, if the congregation held some ladies who were stitchers, I wonder if they contributed to stitching on this…or if they admired it because they could truly imagine the dedication and hard work to complete it! Thanks for sharing these, Mary. Truly beautiful. It appears that the Cope Christ is from a Catholic source (because of the sacred heart emblem and Christ’s finger indicating it). Is it possible that the other is Eastern Orthodox? I’ve seen elaborately embroidered vestments in both traditions, but there are motifs that are individual to each as well. I loved seeing the close-ups on both here and imagining all the many hours that went into the stitching–surely a sacrifice of love. The Cope Christ has more of an Eastern / Byzantine flavor, due to the style of “crown” and a bit of a hint towards iconic facial structure. The other – the “Chasuble” Christ – is Catholic in flavor as well, but not Eastern at all in style. It’s definitely “Western” in style, as far as the image goes. The rest of the vestment it was on has a strange mix of design elements, but this particular Christ is commonly seen in Catholic vestments in the US and Europe, from the late 1800’s to mid 1900’s. Perfect for Good Friday, Mary! The Cope Christ has a look that reminds me of the coach I loved at 17 — oh, I knew he was married and all that — just that for him I would kick the wall and swim another lap! Something about those haunting large eyes. As for the other fellow, his lips are too red, and I don’t want to flash on di Caprio in church. And yet, who can say how many people that image inspired? Happy Easter, Mary! Beautiful choices to show on Good Friday! Thank you, Mary! Question, do you have more photos of the Cope Christ and if not, is it possible for you to say what church it’s from? Happy Easter! 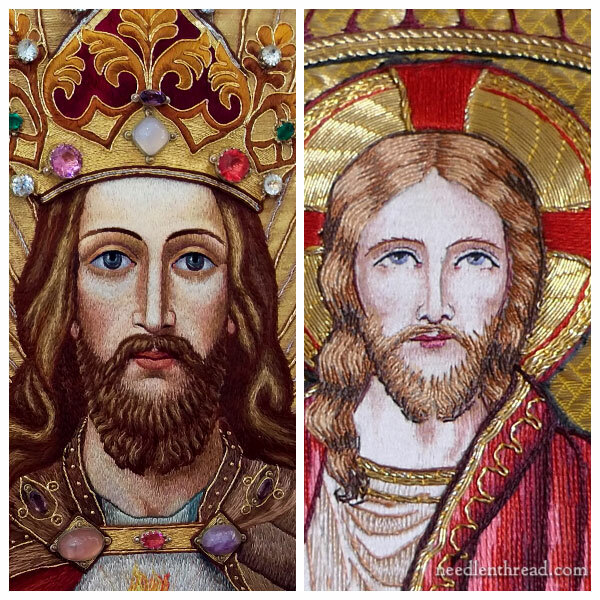 Amazing Embroidery on both of the pieces but loved the one,that of Cope Christ. Previous Previous post: My Thimble Substitute – It Works!